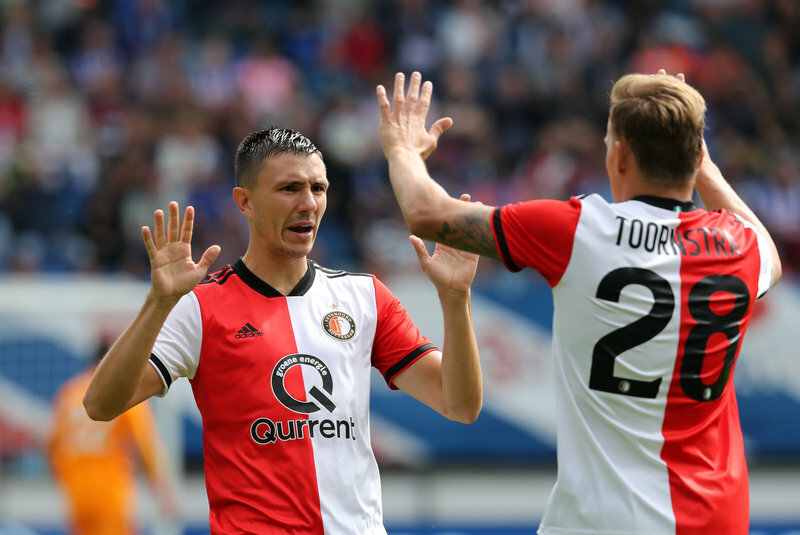 Feyenoord secured three points at sc Heerenveen in a sensational match on Sunday. At the Abe Lenstra Stadium, the hosts looked down and out as Giovanni van Bronckhorst’s side sailed into a 4-0 lead through goals by Jens Toornstra (2), Robin van Persie and Tyrell Malacia. But a fight-back brought sc Heerenveen back within a single goal. In the end though, substitute Yassin Ayoub wrapped up the hard-earned victory for Feyenoord in injury time. It did not take long before the large contingent of travelling fans were able to celebrate their team taking the lead at the Abe Lenstra Stadium. Toornstra managed to get in behind the home defence after four minutes, to flip the ball over keeper Warner Hahn from a Berghuis pass. The visitors doubled their lead within the first fifteen minutes. A Toornstra shot was intercepted by Van Persie, who scored with his right from close in. The two-goal lead left Feyenoord in full control, but the away fans had to wait until just before the break for a third goal. It was a beauty though, with Toornstra shooting into an empty net from around forty metres out after a poor goal kick from Hahn. The fourth goal of the afternoon came within a couple of minutes of the restart. It was scored by Tyrell Malacia, who claimed his first strike in professional football. The left back made ground down the left before coolly sliding the ball under Hahn to seemingly seal the game. Feyenoord went all out to try to add more goals in the rest of the second half, but the breakthrough remained elusive. Van Persie was thwarted by Hahn, while Berghuis saw a shot hit the inside of the post and rebound back in play. Heerenveen did manage to get a goal of their own with around 20 minutes to play. Morten Thorsby left Justin Bijlow well beaten with a bullet header. Kik Pierie added a second five minutes later and with the 90 minutes almost up Dave Bulthuis capitalised on some sloppy play as Feyenoord tried to bring the ball out from the back to make it 4-3. Suddenly the home crowd were dreaming of a miracle escape, but Yassin Ayoub broke the spell in time added on, hitting the ball cleanly into the far corner from Sam Larsson’s layback. The second win on the bounce takes Feyenoord up to fifth place in the table. Next week sees the visit of NAC Breda to De Kuip.